Residents of a small farming community near Sulphur, Oklahoma, feel lucky to be alive after a twister tore through the town, destroying at least five homes, as other deadly tornadoes ripped through the region Monday. Seventy-year-old retired horse trainer Don Rudd was home with his wife when the tornado beared down on his home. "Laid down in front of the sink and then everything just caved in on us," said Rudd. He and his wife were covered in debris in what was left of their kitchen. "My wife started yelling, 'Yeah we're here, we're here, we're here.' She was really scared," Rudd recalled. When a tornado hit Curtis Tweedy’s Oklahoma home, he and his wife say they grabbed onto the house itself and held on until the twister passed. “I was hanging on for nine kinds of dear life, nine kinds,” Tweedy said. 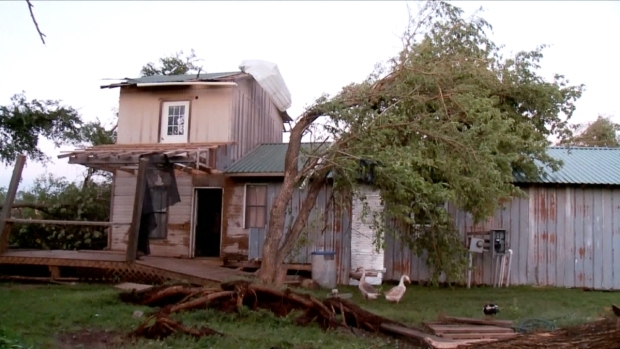 Despite losing their barn, boat and one of their dogs, the couple will rebuild their home. "I told them to get [my wife] out first," he said. "They got her out and they got some stuff out of my way so they could help me out." The family next door barely made it out themselves. Aaron Scroggins said he and his cousin scrambled for shelter as the tornado loomed. "I was like, 'Find the toilet, let's get to the bathroom.' And then, sure enough, we got back there to the bathroom and I told him get down. And then it wasn't a few seconds, that thing was already on top of us," Scroggins said. Incredibly, the bathroom was the only part of the house still standing — barely. "Well, it's Mother Nature, she's going to destroy anything in her path," Scroggins said. "The only thing you can do is get out of the way." Now the cleanup begins, with people sifting through heaps of rubble to salvage any little thing that's left. Mostly, they're grateful they survived. "I'm here. That's all that matters. I'm here," Scroggins said. "I can care less about everything else because it can be replaced and rebuilt." "I'm thankful to God that I'm still alive," echoed Rudd. "My house can be rebuilt. I can't be." 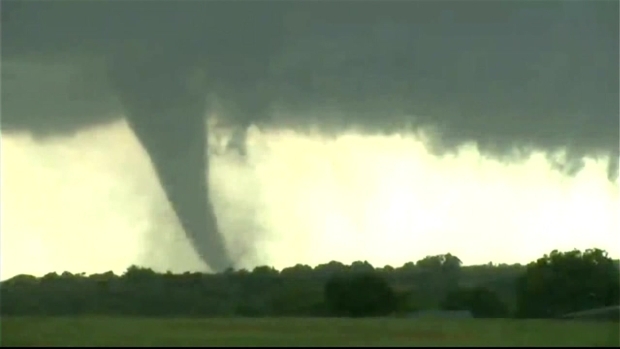 A massive tornado is captured on camera as it rips through Wynnewood, Oklahoma Monday afternoon. Tornadoes killed two people in southern Oklahoma on Monday and forecasters declared a "tornado emergency" for parts of the state.